So I recently watched Grey Gardens, a documentary by the Maysles brothers about Big Edie Ewing Bouvier Beale, aunt of Jackie Kennedy, and her daughter, Little Edie Bouvier Beale. 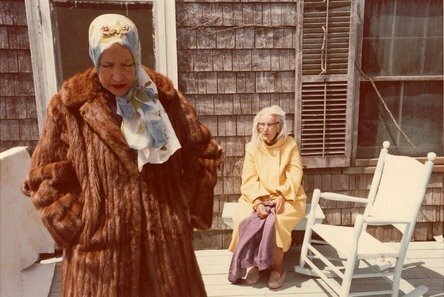 In 1975, Albert and David Maysles visited them in their large but rather lonely house (called Grey Gardens) and had the pleasure of seeing them dance, sing (or at least try to remember the words to their favorite songs), eat birthday cake, feed house critters, take care of their cats, and fight over almost everything. When my dad got the movie out of the library and wanted me to watch it, I honestly thought it would be rather boring. I was very, very wrong. Grey Gardens is one of those movies where you just wish you could travel back in time and be at 3 West End Avenue in Georgica Pond of East Hampton, New York. Big Edie's love and care for her animals is interesting in contrast to her dry sense of humor she shows for Little Edie. Little Edie is very ambitious and free-spirited. Quite a s-t-a-u-n-c-h character. 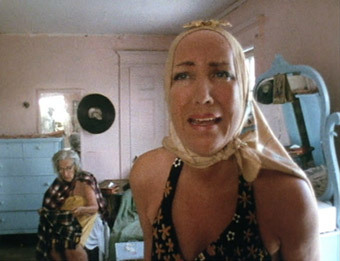 Little Edie wants to go live in New York City and experience the glamorous party life, but feels obligated to stay at home and take care of her mother in Grey Gardens. Though she isn't exactly at the peak of her youth, her style is unique and fresh (not to mention her legs, which even around the age of 57 were gorgeous) The shawls she wears around her head are "for combat", and her dressing got her a spread in Vogue a little after the documentary came out and if you find the pictures online, please tell me! 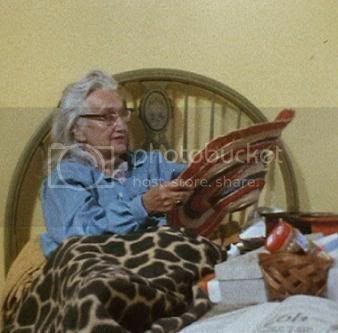 Both women are a little (well, a lot) insane, but their affection for each other and outlooks on life are greatly inspiring, even more so than Big Edie's glasses and Little Edie's swimsuits. A frequent argument amongst the Edies were about Little Edie's love life. She always wanted different things from what her upper-class family and mother thought she needed. She speaks of a man from years before that she knew she should've married but her chance with him was blown, apparently at fault of her mother. However, years after the documentary came out, she phoned up one of the Maysles brothers to tell him that it was him she loved ever since they met but that she just never knew it. With different feelings, he politely changes the subject onto how everyone he speaks to simply adores her (he even said one woman he'd spoken with had watched the movie 200 times, which will be me in 5 years). No doubt that he was telling the truth, the relationship between these two icons have touched the lives of loads of people. 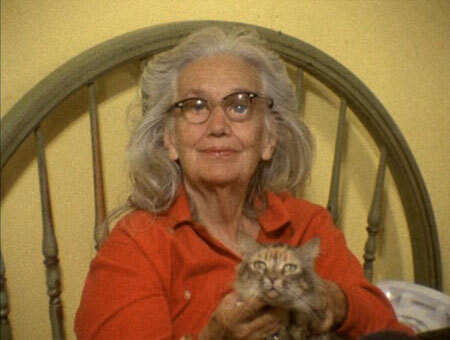 Big Edie and Little Edie are both dead now, Grey Gardens was sold to a former newspaper editor, and surely the raccoons who gnawed at their wall yet they left food for are dead as well, but the Bouvier Beales are far from being forgotten. if you're interested, a little edie-inspired editorial.